Police raided several Sydney properties over the weekend in relation to possible terror plots. 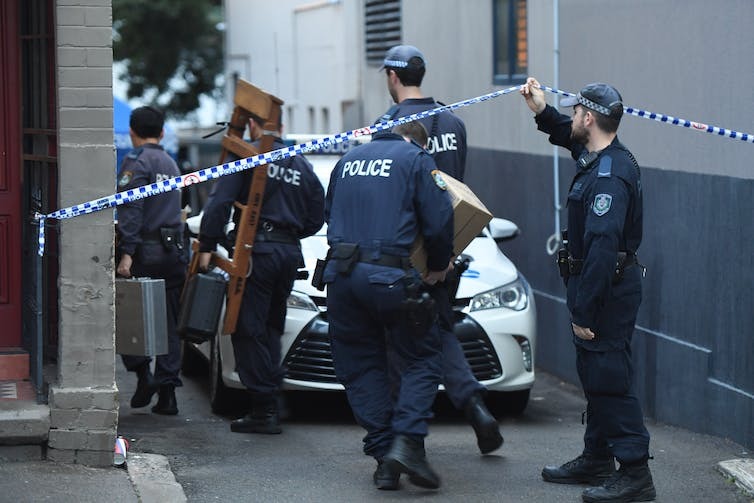 The arrests and raids in Sydney over the weekend, as well as the 12 so-called “terrorist plots” disrupted by police since September 2014, ought to raise questions over whether Australia’s efforts to counter violent extremism are actually working. Australia has spent more than A$1.2 billion since 2015 on strengthening sharp-end counter-terrorism arrangements such as increasing intelligence and security capabilities. Millions more will be spent when the government’s proposed Department of Home Affairs opens. Over roughly the same period, only about $40 million has been spent on countering violent extremism and community cohesion programs. Of this $40 million, only around $2 million was given out in 2015 to 42 of the 97 applicants. This money was to support grassroots organisations to develop new, innovative services to move people away from violent extremism. This funding round was developed to improve Australia’s capability to deliver localised and tailored intervention services. So, there is a significant imbalance between sharp-end funding and piecemeal, short-term, community-level grants. The money is clearly not being invested wisely or even reaching the right places, such as those at-risk communities willing to engage and desperately seeking funding. Many more terror-related arrests will follow in the foreseeable future as a result. All the while, it’s been full steam ahead in relation to security, legislation, corrections, police and intelligence. This has come at the expense of community resilience and building up protective mechanisms within vulnerable youth and communities. From my research with Muslim communities over the past two years, the government’s approach is verging on being counter-productive. It now risks trampling on the basic rights and freedoms of young Muslims, their families and their communities more broadly. This approach will actually worsen the many underlying issues – such as discrimination, alienation, marginalisation and rejection – that seem to contribute to offending in the first place. The safety of all Australians should remain a key government priority. And getting the balance right between security and youth and community welfare is difficult. But the government seems hell-bent on pre-crime arrest, prosecution and punishment, while falling short on providing the necessary long-term support for the young vulnerable people it really needs to protect and prevent from engaging in serious anti-social behaviour. For those from minority communities in particular, the criminal justice system is a very slippery slope. Once in it, the prospects of positive and meaningful futures are slim. As with the UK’s Prevent program, Australia’s approach suffers from multiple, mutually reinforcing structural flaws. Its foreseeable consequence is a serious risk to the wellbeing of young Muslims and Australian multiculturalism more broadly. Much of the centrepiece of the government’s countering violent extremism strategy rests on the theory of radicalisation and the social engineering of radical views and cultures to become more conservative and “Australian”. However, for the concept of radicalisation alone, there seems to be very little clarity about the term and the tools that measure it. If such tools are used to help determine the destiny of a young Muslim person, whether it be in a school or criminal justice situation, then these must be made more available for wider peer review – rather than held in secrecy within the government. For those deemed “radicalised” or on the pathway to radicalisation, there are very few community-based secondary-level intervention programs designed to support them. Nor are there programs they are willing to participate in voluntarily. This is largely because most current programs are led by government and police, which seem to lack a crucial understanding about the many cultural, religious and ethnic nuances required for effective intervention. Without close community partnerships and community-led approaches, programs will never be able to fully understand the highly complex nature of families and communities. Getting access to vulnerable youth and their families, and then encouraging them to participate in interventions, requires close and trusted community partnerships. To date, partnerships between government and the more conservative community groups have not been fully developed. This is particularly the case with the more hard-to-reach groups, which have many of the young people requiring support or intervention. Put together, this has limited the government’s capacity to support and fund communities working with the most at-risk or vulnerable youth. The government’s position on these communities is that they are too risky to work with. In reality, it is too risky not to work with them. To make us truly safe – not just from terrorism, but from other serious crimes too – the government needs to go back to basics. Australia should invest a lot more in longer-term community partnerships and develop more preventive measures, such as community-led interventions. These interventions must be developed by those outside the government’s national security apparatus. A major government rethink is required if it is truly going to keep us safe.